Mike Kelly, curator at the Archives and Special Collections of Amherst College, explores highlights from their Emily Dickinson collection, a huge variety of manuscript forms – from concert programmes to chocolate wrappers – which give us a fascinating insight into how the poet worked. 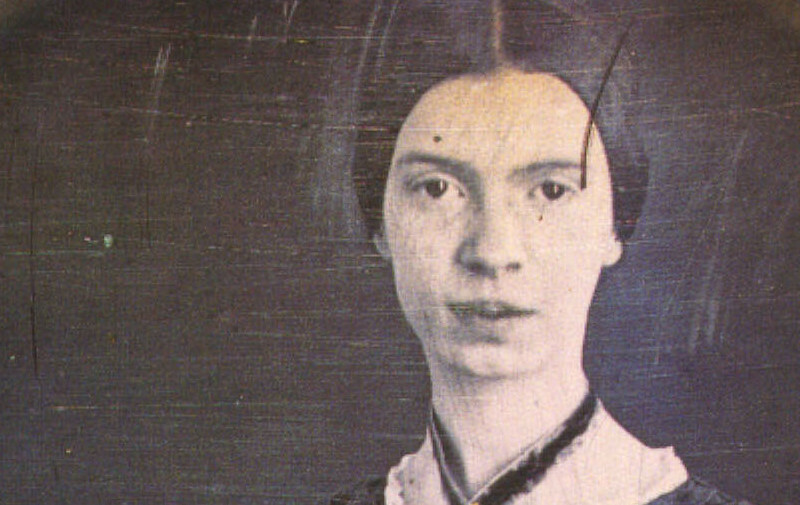 Detail from currently the only authenticated photograph of Emily Dickinson in existence, taken by William C. North ca. 1847 when Dickinson was 17 years old – Source. One of the great benefits of digitizing manuscript collections is that it enables us to view these documents in configurations that would have been difficult, if not impossible, with the original artifacts. When users click through to the Emily Dickinson Collection within Amherst College Digital Collections (ACDC) they see thumbnail images of a dozen or more of Dickinson’s manuscripts. As they begin to scroll through the entire collection they can immediately grasp that Emily Dickinson had a very creative relationship with paper. To achieve this same level of visual familiarity with the originals would require pulling each folder from the box, gently examining the items, then requesting the next folder from the staff at the reference desk. Although I do not consider myself an Emily Dickinson scholar or specialist, I want to share several of the more striking examples of Dickinson’s extraordinary manuscripts. Those interested in delving into the rich world of scholarship focused on Dickinson’s manuscript practice should consult the works of Susan Howe, Martha Nell Smith, Marta Werner, Virginia Jackson, and Alexandra Socarides, among others. Many groups of students, scholars, and tourists visit Amherst every year to tour the homes of Emily Dickinson and her brother Austin. Although Dickinson did lead an active life outside the home in her youth, her increasing reclusiveness in her later years give the very notion of house and home a special resonance in her work. As such, the unusual piece pictured below is of particular interest, just one of Dickinson’s many “envelope poems” – the focus of a recent book, The Gorgeous Nothings by Marta Werner and Jen Bervin. In this instance, Dickinson has cut apart an envelope so all that remains are the flap and a portion of the body. 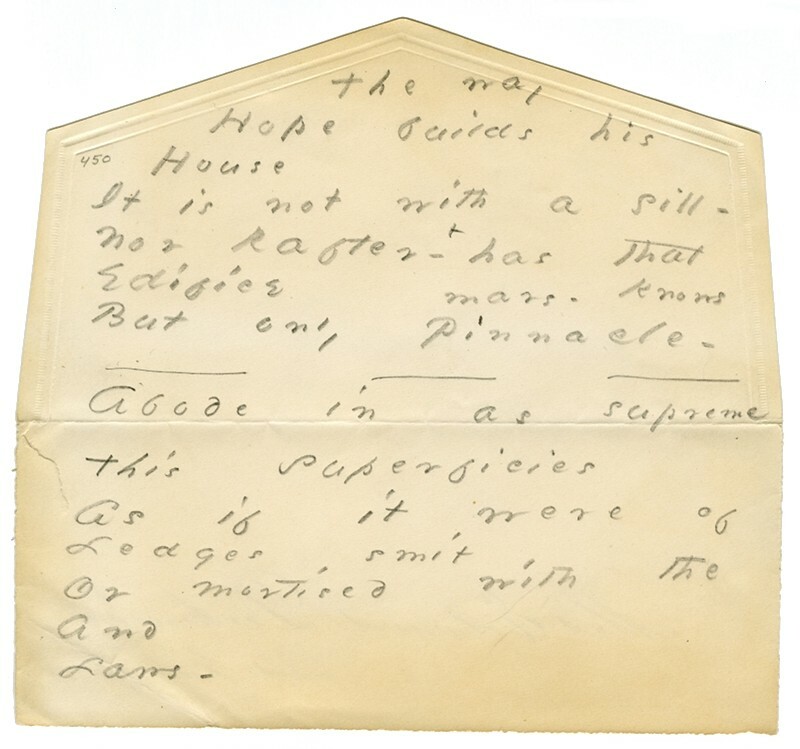 She orients the paper so the point of the flap is at the top then she fills that peak with words: “The way hope builds his house…” Or, to phrase it more directly, she writes a poem about a house on a piece of paper that looks like a house. 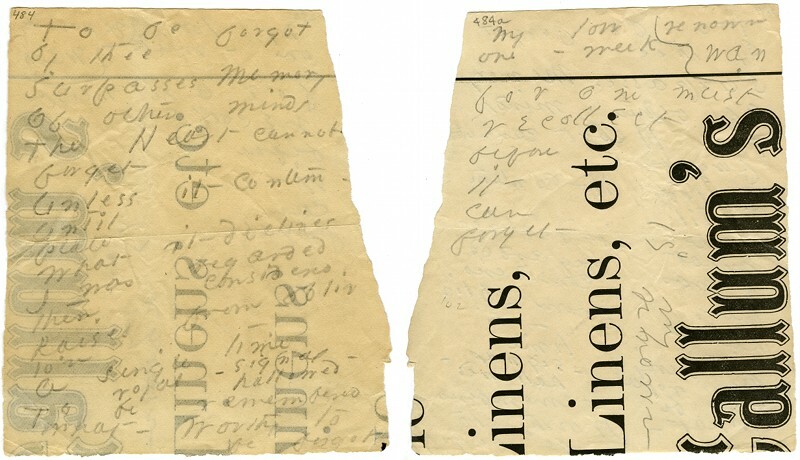 Another notable example of Dickinson’s varied manuscript practise is this torn piece of a chocolate wrapper. The lines written on the back don’t form a complete poem: “necessitates celerity/were better/nay were immemorial/may/to duller/ by duller/things” Of course, we don’t have any evidence of exactly when and where she made these pencil marks, but I like to imagine her in the middle of baking something, or possibly taking a rest while waiting for something to bake in the oven. Was she struck with those lines and urgently grabbed the first piece of paper at hand to capture them before they fled? Was she idly tearing up the chocolate wrapper then jotted down the words it sparked in her brain? The joy of such a collection as this is that we will never really know, but this object can inspire a universe of speculation in a way that the lines on their own, transcribed into print and packaged as a scholarly text never could. 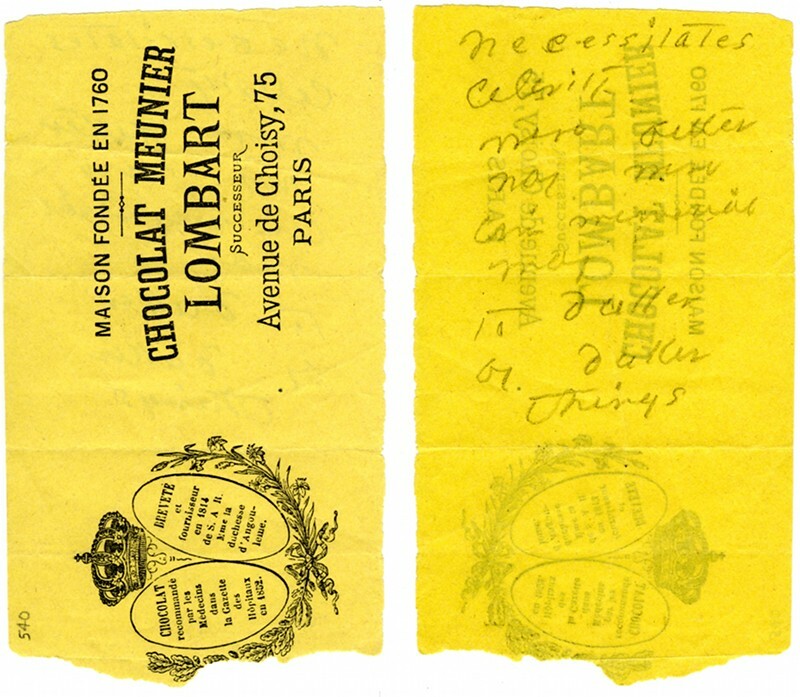 Also: chocolate from Paris was somehow available in Amherst, MA in the mid-nineteenth century. Good to know. Dickinson’s skill as a baker of bread is well documented — her loaf of Indian and Rye won second prize in the Amherst Cattle Show of 1856. The Emily Dickinson Museum in Amherst regularly serves up gingerbread and coconut cake made from Dickinson’s own recipes. This manuscript on a small slip of paper reveals that doughnuts were also part of Dickinson’s baking repertoire. The other side of the sheet identifies this recipe as “Kate’s doughnuts,” though there is no evidence of exactly which Kate. 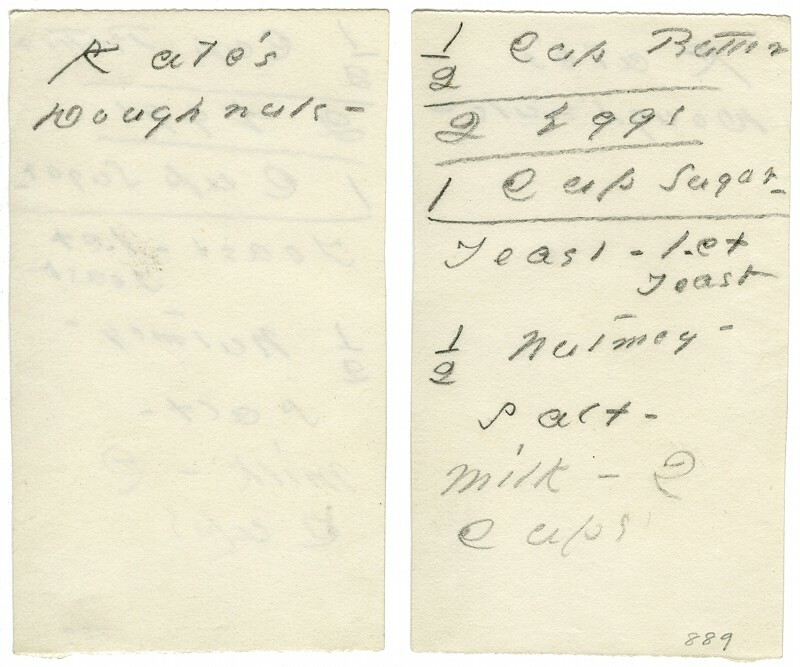 Kate’s doughnuts, Amherst Manuscript # 889 – Source. In the case of the next manuscript of a coconut cake recipe, we do know that the Mrs. Carmichael it credits was an Amherst neighbor. Unlike “Kate’s doughnuts,” the coconut cake recipe shares a sheet of paper with the poem “The Things that never can come back, are several,” once again prompting one to speculate on which she wrote first. “The things that never can come back, are several”, Amherst Manuscript # 445 – Source. 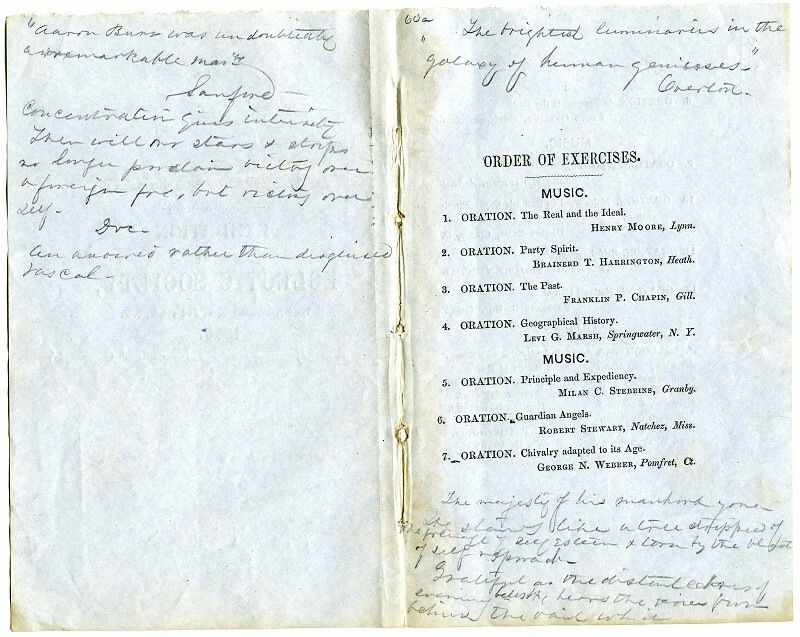 Program of the Exhibition of the Eclectic Society, Amherst Manuscript #60 – Source. 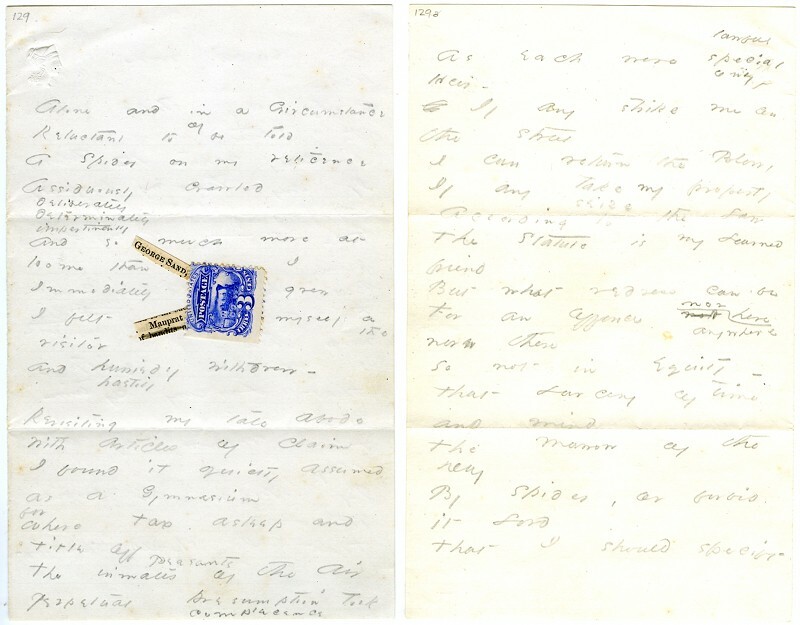 Another standout piece in the collection is the manuscript upon which Dickinson has written the poem known as “Alone and in Circumstance”. The first four lines of the poem are generally interpreted as setting the scene in an outhouse: “Alone and in a circumstance/reluctant to be told/a spider on my reticence/ assiduously crawled” In fact, visitors to the Emily Dickinson Museum will find a copy of this one hanging in their public restroom. But beyond the humorous treatment of meeting a spider in the privy, this manuscript features a small bit of collage work. An unused three-cent stamp is affixed to the center of the page with two carefully clipped bits of text sticking out from underneath the left edge. Scholars have tracked down the original source of these two clippings – Harper’s Magazine for May 1870. [Freely available online through Harper’s at: http://harpers.org/archive/1870/05/] In the section of the magazine titled “Editor’s Literary Record” includes a review of several of George Sand’s novels, including Mauprat. The bits Dickinson carefully excised from the family copy of the magazine are “George Sand” and “Mauprat.” The postage stamp has been identified as an 1869 issue that features an image of a locomotive. Upon the theme of wasting perfectly good postage, it is important to remember that Dickinson was never at a loss for paper, stamps, ink, or pencils. Her father and brother were both lawyers, a profession that depends on ample stores of paper and ink, and many of Dickinson’s extant manuscripts are on standard stationery paper. So when we come across irregular pieces such as this one, one needs to stop and think about her motives. While the back of a chocolate wrapper makes a certain sense in light of Dickinson’s known baking activities, what are we to make of the many other fragments she left behind? “To be forgot by thee”, Amherst Manuscript # 484 – Source. 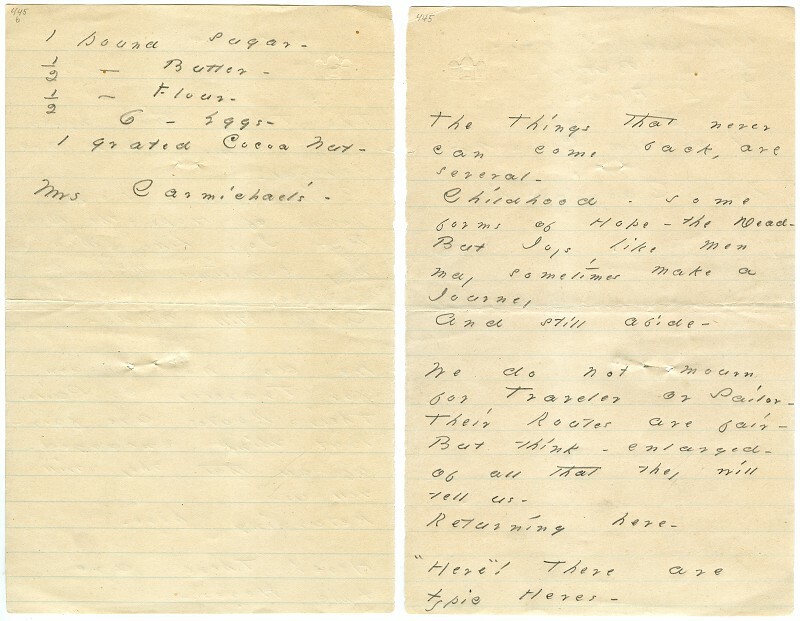 “Two things I have lost with childhood”, Amherst Manuscript # 878 – Source. This selection of Dickinson manuscripts is merely the tip of the iceberg – all 850 discrete manuscript objects held by Amherst College are freely available online for all to explore. Our hope is that the ability to browse the collection virtually will spark new questions and new approaches to understanding one of the world’s most beloved and enigmatic poets. Mike Kelly is the Head of the Archives & Special Collections in the Frost Library at Amherst College. His research interests range from the history of nineteenth-century publishing to contemporary comic books. You can follow the activities of the Amherst Archives – including ongoing digitization efforts – at consecratedeminence.wordpress.com. Visit Amherst College’s online Emily Dickinson collection to see all 850 of Dickinson’s manuscripts in high resolution, available to download and re-use free from restrictions.